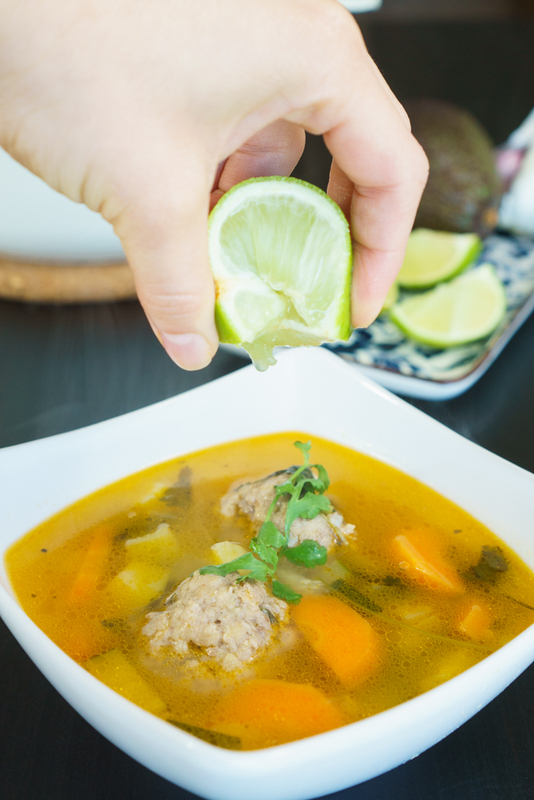 This sopa de albondigas (meatballs soup) is such a creative way to transform a plain beef soup into something more special and yummy. This soup is a complete lunch by itself. You have protein, veggies, and carbs if you add some rice — personal advice. You’ll get a Mexican flavor packed soup. How to make the Albondigas? The meatballs are the soul of this recipe. They are the strong flavor — along with the jalapeños — of this soup otherwise plain. The key it’s to season the meat with the right ingredients. I prefer to only add dry or powder ingredients. Some people add finely chopped onion or bell pepper. I prefer to keep my meatballs without weird chunks. Besides that season, I add the infallible mix of egg and breadcrumbs. This will compact the meatballs and prevent them from falling apart while cooking on the soup. How to make the soup base? Every single time I have to make soup I remember my mom. She always tells me “haz un sofrito” — make a sofrito. This means that instead of boiling all the ingredients, I cook first the onion, the garlic and the tomato paste with a bit of oil. This way a flavorful base is created and when you pour the beef broth you get a deeper soup. In the “sofrito” for this albondigas soup, I also add a small jalapeño — because Mexico — to get a spicier yet subtle result. After I get this base done, I add the beef broth, the veggies (carrot and zucchini), the meatballs and some coriander for more South American flavor. Final tip: add some lime juice. The acidity will balance all the flavor and will tone down a bit the greasy taste that beef broth sometimes has. I promise you that you won’t regret a few drops of lime juice. Mix all the ingredients for the meatballs. Using your hand, mix it well until you get a homogeneous mixture. Make medium size balls (this recipe serves 8 – 10 meatballs). In a big pot heat the oil over medium heat. Add the onion, the garlic, the tomato paste, and the jalapeño and cook for a couple minutes until it’s fragrant. Pour the water and the beef broth. When it starts to boil add the meatballs and the fresh coriander. Simmer for 10 minutes. Add the zucchini and the carrots and cook for 15 – 20 minutes until the carrot is fork tender. Serve the soup and add some drops of lime juice.